Kelley Klean was founded by Dennis Thrower in 1986 as a commercial and residential carpet cleaning company. Servicing the Columbia, MO area at the time, Dennis built his business through customer satisfaction, repeat business and customer referrals. After years of consistent hard work, keen attention to detail, and excellent customer service, his business evolved into what we know as Kelley Klean today. Now servicing the Columbia, Jefferson City and Central Missouri areas, Kelley Klean has built a reputation as the most efficient Emergency Service cleaning and Total Property Restoration Company in the Central Missouri area. Certified by the IICRC in Water Damage, Smoke & Odor, Trauma Restoration, Upholstery Cleaning and Advanced Structural Drying, Kelley Klean has made a commitment to ensuring our staff and our team of technicians are properly trained. With experience handling all types of property losses over the years, Kelley Klean can be the restoration contractor of choice for any unique situation that is facing your location. 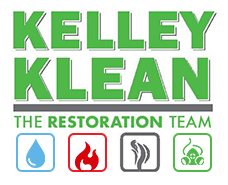 Kelley Klean has restored residential properties of all kinds. From single room studios to massive mansions, we have the expertise to take on it all. For nearly 30 years, Kelley Klean has worked with property owners to help quickly restore their commercial buildings. These projects are unique since limited downtime is required, and more complexities can be present. However, Kelley Klean has the expertise required to get the job done right, within the presented challenges of each unique situation. When damage occurs in an Industrial facility, downtime simply is not an option. So, at Kelley Klean, we make sure to set up containment barriers of the affected areas and perform our services while adhering to the facility’s aggressive production schedule. Kelley Klean is a licensed and insured to take on any sized residential, commercial and industrial project. Certified by the IICRC, we have invested in the proper training in order to meet the needs of any project presented to us. When you choose Kelley Klean, we will pull from our extensive bank of experience to perform a job you are happy with. We place a special emphasis on each job and follow a certain set of criteria in order to provide you the best customer service in Central-Missouri. At Kelley Klean, we are available 24 hours a day, 7 days a week and 365 days a year for emergencies. We have trained dispatchers on-hand to take your call no matter what the time. An emergency at your property requires a fast response for a reputable company. At Kelley Klean, we can get you up and running in very little time. If you have experienced a property loss, or need junk removed, give Kelley Klean a call. As a comprehensive property contractor specializing in restoration, remediation and property repair and clean up, we can be your one contractor of choice in the Central Missouri area. Our trained staff is standing by to take your call. If you have a question, would like a quote for our services, or would like to discuss your unique situation, please give us a call at 573-214-0990!